Making white wine, actually any kind of wine making, is like magic for most people, me included. Producing white wine, in particular, seems to require a light hand. From grape picking to fermentation, the goal of the winemaker is to preserve the integrity of the grape's delicate flavor and aroma. The production processes for white wine and red wine are somewhat different. The first difference is in the harvesting of the grapes. The harvest of grapes for white wine is done in a gentle and delicate way. Care is taken to make sure that the skin of the grape does not break, because if it does, it will release tannin into the juice. Tannin and white wine do not go together very well. While red wine benefits greatly from tannin, most white wines do not, they are meant to be more subtle. In making white wine, the skins, seeds, and stems will soon be separated from the juice. Again, this is done so that the tannin is minimized. After the grape is pressed, the juice will be either transferred to a tank so that the solids can settle, or it may be filtered. Once the solids have settled, and separated from the juice, fermentation can begin. Fermentation takes place when the sugar in the grape juice turns into alcohol. Yeasts are naturally present in the wine, but the winemaker may want to add cultured yeasts in order to have better control of the process. White wines are usually fermented at a much cooler temperature than red wines. While red wines are fermented at a temperature of about 70ºF to 85ºF degrees, white wines are fermented at about 50ºF to 65ºF. This leads to a fruitier, fresher and more delicate wine. In the 1960s the use of stainless steel tanks with temperature controls became more and more prevalent. Making white wine became easier with this innovation. After fermentation, the lees may be removed. Lees is the name given to the spent yeast cells. Then the wine will be cold stabilized by keeping it at a temperature just above freezing for several days. This is done to prevent tartrate crystals (tartaric acid) from forming in the bottle. Some white wine may be aged in wood barrels at this point. Not all white wine is treated this way. 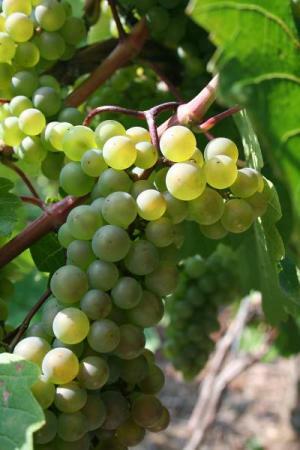 Some full bodied grapes, Chardonnay for one, are often fermented and/or aged in oak barrels. These wines will also be left in contact with the lees for a longer period of time, perhaps as long as 12 months. This will give the wine a richer texture and character. 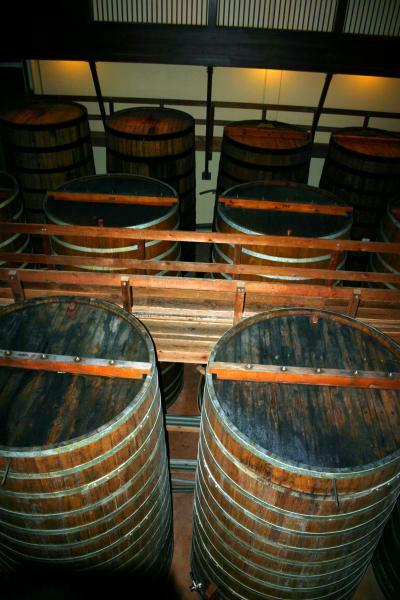 Fermenting and aging in oak barrels will make for a softer and smoother wine. But contact with oak is not for all. While a Chardonnay will be wonderful when oaked, a Riesling will only taste like yucky wood! Barrels can last as long as 6 years, but it is up to the wine maker to decide whether the wine will benefit from new wood, or from barrels that have been used for two or three years. After aging, whether in a stainless steel tank or an oak barrel, the wine will be bottled, and then left to age in the bottle for a while longer, though not as long as red wines. Most white wines are better when consumed at a younger age. Open the bottle and pour. Enjoy!